Visitors to New Orleans’ Art District can glimpse an intimate view of renowned artist Tom Nussbaum’s artwork from March 3 through the 31. His work, which is displayed at Octavia Art Gallery for the month-long residency, is found in several public and private collections across the country—from the Montclair Museum of Art and the Princeton Public Library, both in New Jersey, to the Chase Manhattan Bank in New York and Hasbro Inc.’s headquarters in Rhode Island. Nussbaum’s work often references vessels and baskets, utilizing architectural frameworks of buildings, towers, and the human figure to create unique shapes and structures. His current body of work explores connections between the organic, human figure and forms found in nature, architecture, and technology. 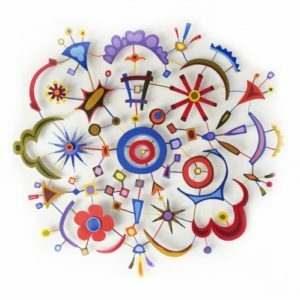 Nussbaum’s artwork is bright, colorful, and playful—a popular choice for every art-lover. Part of Nussbaum’s residency at Octavia Art Gallery is a new series of work called Recent Constructions. The artwork includes several free-standing sculptures that, though delicate in appearance, are constructed of sturdy steel rods and wire. Though these pieces are playful, they are rooted in Nussbaum’s methodological approach to architecture and object. Tom Nussbaum has been a visiting artist and lecturer at the University of Minnesota, Montclair State University, and Rowan University. This is a show you do not want to miss. Octavia Art Gallery is open Tuesday through Saturday from 10AM to 6PM and by appointment. For more information about this current exhibition and Octavia’s hours, see the gallery website.